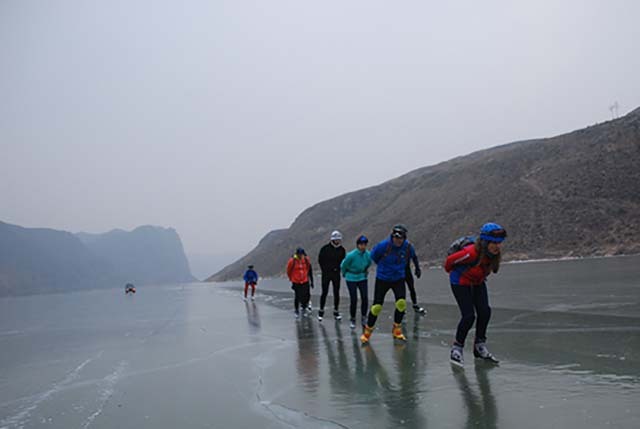 Following the enormous success of the Great Wall Ice-Skating Challenge 2015 and 2016, FIT Sports Adventure Travels organises again this unique ice-skating event in the New Year holiday season 2018/2019. A 13-day skating tour is offered to youngsters and adults on the ‘holy river’ running like a snake through the magnificent Chinese landscape bordering Mongolia. 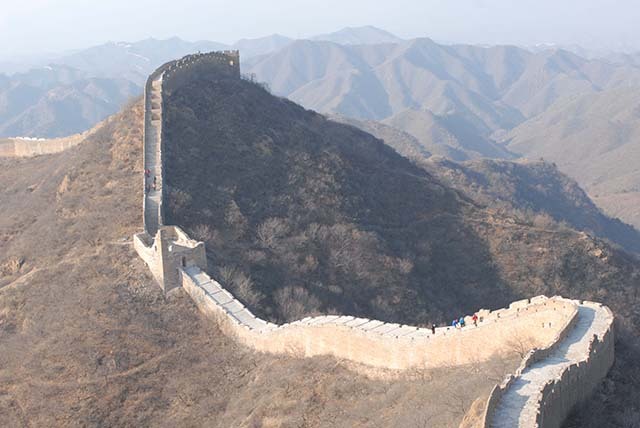 Here, countless remnants of the world longest defence-lines are to be seen: the Great Wall of China! One can choose from 10, 20, 50, 70, 100 kilometer skating trips per day! (2 days marathons and 1 day extra skating). Thus, also options for those who don’t want to/ can’t skate 200 km per day! By the end of November the ice will be thick enough (50 to 60 cm’s) to allow skating! During the day the temperature will be around -6 degrees Celsius, but the nights will be considerably colder! However, during daytime it always will yield bright sunshine! Ice-skating track of 40 kilometers and a short cut of 20 kilometers. We create a fantastic skating track on the yellow river Huanghe, in both directons with constant turns to the left and to the right. The (shorter) left turns track is open for skaters who don/ t want to skate the distance of 200 kilometers, whereas the (longer!) right turns track is available fort he true ‘die-hards’! Every skater crosses the starting and finishing line and collects various stamps, marked on a card. Like a snake the river runs through the mountain landscape and provides a magnificent view together with an awesome experience! Along the track there are various first aid tents and medical supplies to offer adequate health care. Local farmers – as enthousiastic fans – form cheering crowds for the necessary ‘moral support’, while local singing groups bring traditional music around the evening campfires! For sports people who don’t want to skate long distances a separate ice-skating track is being provided. During your first skating kilometers, the speed will be low with ample time to absorb the beautiful surroundings. While in constant surprise and admiration, your camera makes overtime to catch the scenery you’re ‘engulfed’ in! After the Jangtsekiang river, the yellow Huanghe is the second longest river in China, measuring 5464 kilometers and an average width of 500 meters. Worldwide the Huanghe is ranked number six. It runs through nine Chinese provinces and finally ends in the Bohai Sea. The river has always been considered to be the “cradle of Chinese civilization”. However, following often flooding, changes in stream basins and elevation of the river bedding (up to a level higher than the surrounding fields! ), the Hunghe received the questionable nicknames of “China’s sorrow” and ‘The Scourge by the Sons of Han”. On one hand Huanghe is seen as a blessing from heaven, on the other it is often beleived tob e the personification of the devil! Huanghe’s stream can be very turbulent yielding enormous transports of sediments, giving the river its characteristic name. It ‘re-locates’ 6 tons of mud every second en deposits yearly 1,4 billion tons of solid sediments in the Bohai Sea. Dams are being built in the river, but the lakes behind these dams suffer under a continuous growth of silt. 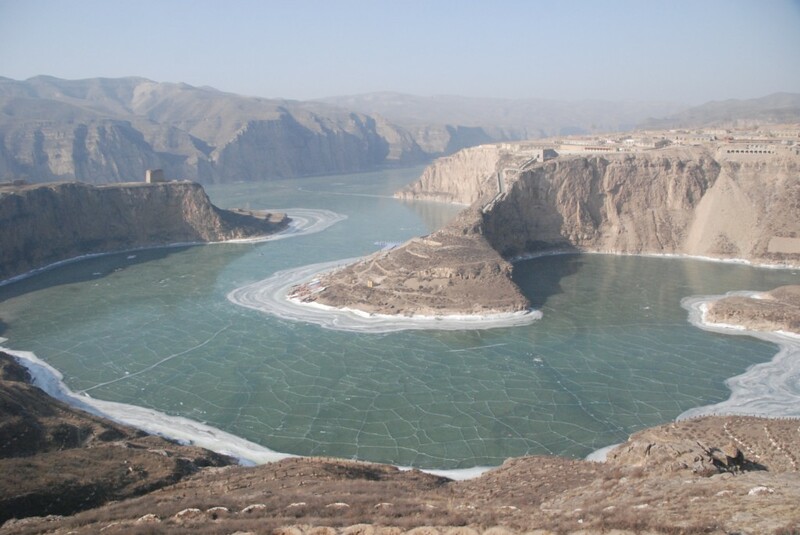 However, the creation of such a dam in the north of China has provided FIT Adventure Travels the ultimate opportunity to organise a beautiful and challenging ice-skating event! This trip will show you China that stays hidden and unknown for the average traveller. You will truely experience the atmosphere of the authentic rural Chinese society. Lodging is offered in bed&breakfast facilities with local farmers and/or in simple, but comfortable hotel accomodations. Along the yellow river Huanghe, life is ‘basic’: no showers, but an abundance of warm water! Constant options are available to expand your trip via the Trans Mongolia Express, one of the most famous train trips in the world, taking you from Moscow, through Siberia and Mongolia up to Bejing. The event is allowed to take place with a minimum number of 50 participants. In case the event has to be cancelled, you will be informed not later than December 1, 2016. When the minimum number of participants is registered, you will be informed respectively and accordingly. Transfer tot he hotel and wellcoming dinner. Biking. This is the ideal way to get to know Beijing; from the ancient parts of it you bike to the ‘Forbidden City’ for a visit of 2 hours. In addition you drive to Tiananmen Square, where you will stay 30 minutes, followed with a lunch (included in the price) close to the Temple of Heavenly Peace, that the Emperor visited four times a year to pray for prosperity when harvest time arrived. After lunch you can visit this world-famous, magnificent building surrounded by a glorious park landscape. Here we witness local Chinese people having a good time while dansing and playing. Around 17.00 hours you will arrive back in the hotel. Following an early dinner you will take the night-train to Hohot, the capital of Inner-Mongilia. Following the arrival in Hohot a 4 hour bus trip takes you to the Yellow River near Laniowan. Along the way you will enjoy China as it stays ‘hidden’ for the average traveler. After arriving at the Yellow River location cave dwellings are assigned to you. These ‘caves’ will offer you lodging in a ‘primitive’, but very cosy setting. Heated with a stove, these dwellings don’t have showers and toilets are situated outdoors. However, there is warm water available in abundance! Shortly after having arrived here you put on your ice-skating clothes to explore for the first time the 40 kilometer ice-track, while supervisors stand by. Two days of ice-skating will challenge you to skate a marathon and/or the distance(s) of your own choice. Starting and finishing lines are indicated and stands are present to collect various stamps, marked on a card. Along the track there are various first aid tents and medical supplies to offer adequate health care. Lunch is served on the ice! Today the choice is yours: either enjoy a third day of ice-skating, or explore the local surroundings, e.g. the magnificant old castle near the Great Chinese Wall. Here army officers had their lodgings, while you will enjoy the breath-taking scenery of the landscape, with the Yellow River running through. Leaving early in the morning a 5 hour bus trip takes you tot he Yellow River near Shuozhou City, where you enjoy a late lunch, before travelling on to Datong City. After dinner you have the opportunity to explore the city. This day’s program includes a visit to the Yungang’s caves, Buddhist Temple Caves, excevated in the shape of honeycombs in the southside of the Wuzhoe Shang mountain. The entire complex includes 252 caves that contain more than 51.000 big and small statues, varying in size from 2 tot 3 centimeters up to 17 meters! The majority consists out of Buddha statues, some of which have monumental sizes, while other miniscule appear in innumerable rows and series. Beside Buddha statues you will encounter sculptures of fairies and musicians, expressing the happiness of The Enlighted and more earthly figures who played an important role in the life of Buddha Gautama. 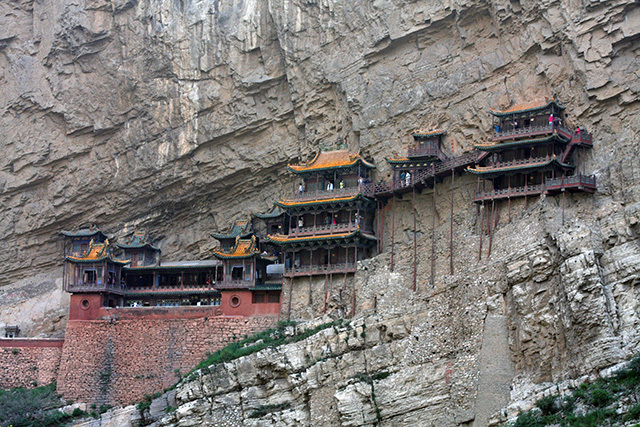 Next, the trip will take you to the Hanging Temple, built 1500 years ago out of a cliff 75 meters above the ground. Not only its position is remarkable, but also the fact that it is the only existing temple where three tradional Chinese religions are combined: buddhism, taoism and confucianism. Before exploring the temple, lunch will be served and following the visit of the Hanging Temple you will be transported to Taiyuan City where a lovely dinner is awaiting you! 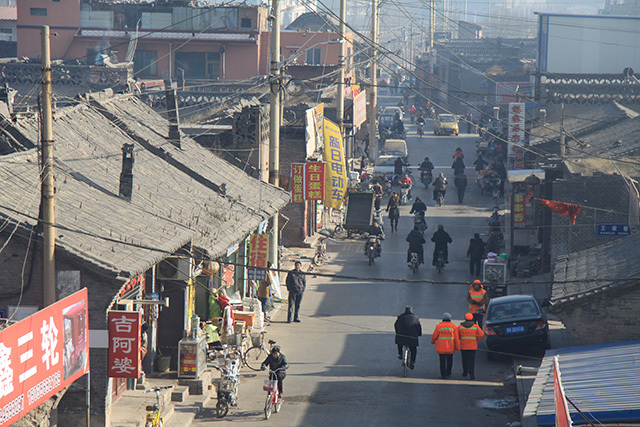 After breakfast you leave for the old centre of Pingyao, a remarkable well-preserved tradional Han-city, surrounded by a completely intact (6 kilometer long) city wall from the ancient period of the Ming-dynasty. Old temples and houses within the city provide a unique impression of architecture and city planning systems in the Old Chinese Empire. During the Ming- and Qing-dynasty Pingyao was a properous trading city giving rise to the first banks in China and leaving the city the opportunity to develop itself into a dominant headquarters for the financial sector. This city-trip is for private exploring and viewing. Following breakfast you fly to Beijing where you arrive in the afternoon to have ample opportunity for private exploring and viewing of this great city! After breakfast a bus-trip takes you Beijing International Airport, where the plane takes you back to The Netherlands. International flight to China: ± € 550,= (depends on the time of booking; early booking might yield a lower price! ).